Natural disturbances such as fires, windstorms, floods, and herbivory often act on plant communities, affecting their structure and the abundance and composition of their species. Most research has focused on the effects of single disturbances on plant communities whereas the synergistic effects of several disturbances have received less attention. In this study, we evaluated how timing and severity of tree mortality modified plant use by introduced deer and early post-mortality successional trajectories in northern Patagonian conifer forests. We sampled understory composition and deer use in Austrocedrus chilensis (ciprés de la cordillera) forest stands undergoing varying timing and severity of forest mortality as reconstructed using dendroecological techniques. In addition, we evaluated the effect of fallen logs on plant composition and deer use of plants by monitoring areas of massive dieback where fallen logs had been removed for fire hazard reduction, and nearby control areas not subjected to such removal. Stepwise regression analyses showed that history and severity of tree mortality strongly influence plant composition and deer use of plants. For deer use (with pellet counts and browsing index as response variables), results showed a positive relationship with degree of stand mortality and a negative relationship with cover of fallen logs. 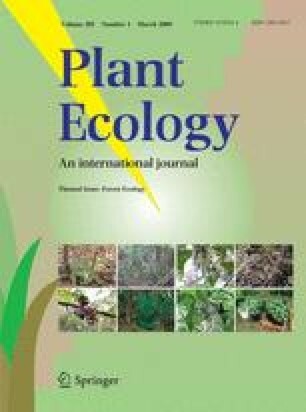 Similarly, cover of unpalatable shrub species was explained by canopy mortality history, whereas cover of palatable shrub species was positively associated with severity of canopy mortality. In areas where fallen logs had been removed, pellet counts were six times higher than those in control areas. Though total shrub species cover was similar between log removal and control areas, proportion of unpalatable shrubs increased in areas where fallen logs had been removed. In conclusion, deer use of plants was strongly limited by tall fallen logs, allowing palatable species to establish and grow. Fallen log removal accelerated deer entrance and changed understory composition toward more browse-resistant and unpalatable species. These results underscore the importance of considering the dynamics (timing, severity, and extent) of fallen woody debris influencing understory herbivory and post-disturbance succession. In addition, experimental results underpin the importance of maintaining snags and large woody debris in disturbed landscapes where salvage logging is a routine procedure. We wish to thank Diego Vazquez for valuable comments on the manuscript, park rangers of Isla Victoria (Damián Mujica, Lidia Serantes, Domingo Nuñez, and Carina Pedrozo) for helping us in many ways. Delegación Técnica Regional and Intendencia del Parque Nacional Nahuel Huapi assisted us with working permits, and Cau Cau and Mares Sur with transportation. We are especially grateful to Juan Gowda for helping on cross-section tree extractions, and Eduardo Zattara for his field assistance. Daniel Simberloff revised several versions of this manuscript improving the language and clarity. This research was supported by a postdoctoral fellowship to M.A.R from Consejo Nacional de Ciencia y Técnica of Argentina CONICET and by funds from Universidad Nacional del Comahue. Foundation Linnaeus-Palme funded C.L.W scholarship.